Welcome to Talkin’ Shop! I’m C.C., and I cover the ECHL’s Idaho Steelheads for Sin Bin Media at www.thesinbin.net (in written form) and also do two podcasts for The Sin Bin: Hockey Talk and In The Corners. Talkin’ Shop is mainly compromised of post-game interviews with Idaho Steelheads players and coaches. Enjoy! Wondering where all the Hockey Talk podcasts went? Have a listen and you'll find out the future of Hockey Talk...and what other thing lay ahead for me, C.C., as we move forward into the summer! The Idaho Steelheads dropped their second straight game against the Allen Americans on Saturday night in Boise, falling down 2-0 in the best-of-seven First Round match-up. Steelheads rookie forward Justin Parizek was kind enough to join The Sin Bin for a moment after the loss, taking us through his tip-in goal to bring the game back to a one-goal deficit, the success of the second line in the first period, and the team's confidence going into Game 3 next Wednesday. The Idaho Steelheads find themselves in a precarious position in Round 1 of the 2018 Kelly Cup Playoffs. After dropping two home games to the Allen Americans, Idaho finds itself in a 2-0 series hole heading to Texas for a potential three-game set. Before heading out to Texas, Steelheads Head Coach Neil Graham touched base with The Sin Bin, speaking on Allen's goaltender Jake Paterson, some basic strategy for Game 3, his lack of concern (prep-wise) being either at home or away, and the return of captain Jefferson Dahl from his AHL PTO with Cleveland. Idaho Steelheads captain Jefferson Dahl recently returned from his PTO with the AHL's Cleveland Monsters, practicing with Idaho for the first time since his seven-game AHL stint on Monday morning. Dahl took a quick moment after said practice to discuss his time in Cleveland, being reunited with his second line fowards Cole Ully and Max French, and his overall excitement level in rejoining the team to take on the Allen Americans in Game 3 of the 2018 Mountain Division Semifinal. The 2018 Kelly Cup Playoffs began for the Idaho Steelheads against the Allen Americans on Friday night at CenturyLink Arena. It was a tough battle, but Allen pulled ahead for the 3-2 victory to take Game 1 in Boise. Idaho defenseman Eric Sweetman discussed post-game how he wasn't very concerned with his two-assist effort tonight, how he's gelled with the first line forwards, how he takes responsibility for his defensive lapses, and what his gameplan is for Game 2. With a hard fought weekend sweep of the Utah Grizzlies, the Steelheads helped play spoiler in officially eliminating Utah from playoff contention. Idaho Head Coach Neil Graham talked about his expectations from the division rival, Zach Bell being on reserve, Max French coming back from the AHL'S Texas Stars, and how Idaho stays true to who they are & even keel in the face of unbridled agression. 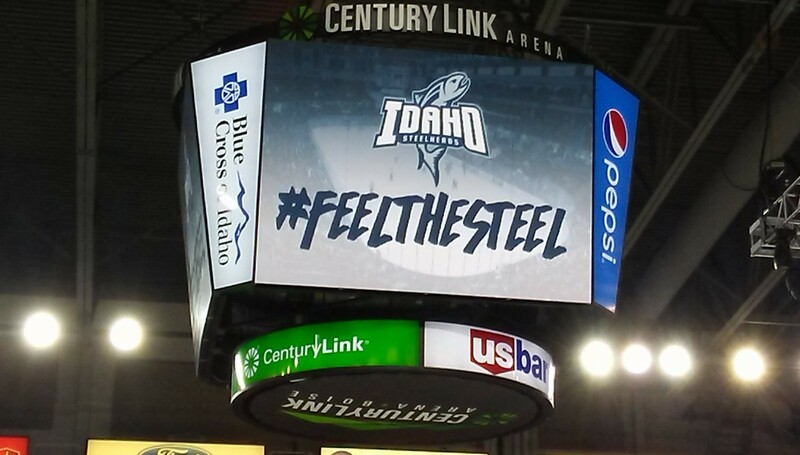 The Steelheads defeated the Utah Grizzlies 4-2 in a hard-fought battle on Saturday night at CenturyLink Arena. Idaho forward Max French skated in his first game back from the AHL's Texas Stars, netting a goal in his return. He took time out to speak on not only his goal scoring, but also his physical play, if he required any adjustment coming back to the Steelheads, and if he'd rather be on the Stars or the Steelheads going into the playoff push. Idaho Head Coach Neil Graham gives The Sin Bin the rundown after a 2-1 shootout victory against Rapid City Wednesday night. He talks strategy when facing a hot goalie (RC's Adam Vay had 49 saves) and why he put Charlie Dodero in Round 5 of the shootout. Idaho Steelheads defenseman Charlie Dodero went and had himself quite a night against the Rapid City Rush on Wednesday. Dods talks about his goal scoring, penalty committing, his slow approach in the shootout, and whether his time with Greenville helped with Idaho's recent road trip to Atlanta and South Carolina. Idaho rookie goaltender Tomas Sholl has done nothing but impress since his arrival to Idaho on March 1st. Hear him talk post-practice about his hot start, stints in the SPHL and ECHL, and the last eight games of the regular season.